Even though Mr. X usually plays Jewish guys on TV, he’s half Italian and half Croatian. Being from New York, I know very many Italians, but he’s the absolute first Croatian I ever met! Actually, he’s American from Jersey, but his father was so Croatian that I could barely understand a word he said! And I loved that. It meant so much to me when he first broke-out a map of Croatia and explained it all to me. I wish his dad was still on this level of life so that I could tell him about this lovely evening of all things Croat I attended last week, which was the first time that I was in the company of about three hundred Croatians, all sounding like him! I wish I could have chatted with everyone there. Photo by Karen Salkin, as is the big photo at the top of the page. Before I tell you all about this special evening, I must say that as a major sports fan, I always root for Mr. X’s countrymen, such as tennis star, Marin Cilic. So I was happy to see not only Marin but a few others in a promo for the Croatian National Tourist Board that night. In it, Marin proclaims, “When you want to lift your spirits sky high, you have to come to Croatia!” I was happy to hear that because now I don’t have to feel so bad when he keeps getting beat by The Stranger I Love Most, Roger Federer! 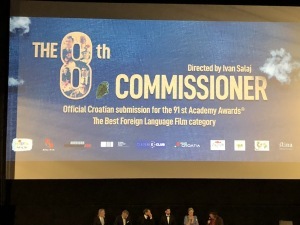 The occasion for the “Film” part of the “Night” (in the title above) was the United States premiere of Croatia’s official submission for Best Foreign Language Film for the upcoming Academy Awards. I really never thought of this before, but all the films in America are eligible for nominations each year, but the other countries can each submit only one film each, out of all of theirs! That’s a lot of pressure on movie studios to produce the country’s best. And, in this case, I don’t doubt that The Eighth Commissioner is exactly that! To be honest, I was concerned that I wouldn’t be able to sit still for the entire two hours and twenty minutes of it. But, even as slow-paced as it is, I was riveted. I have so many questions about this film! The filmmakers. Photo by Karen Salkin. 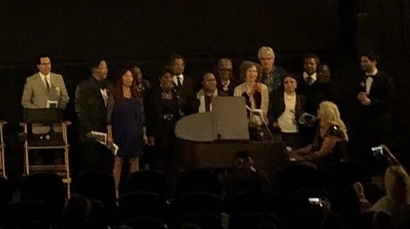 I would have queried the filmmakers themselves, who were all in attendance that night, but the post-screening reception, in the courtyard of the Egyptian Theater in Hollywood, was so packed that I couldn’t even find any of them! So, when I got home, I grilled the half-Croat Mr. X, and when he did not know as much about his father’s homeland as I would have liked, I stayed up all night researching the topic for myself. I’ve been fascinated about lightly-inhabited islands for a few decades now, ever since I learned of the crazy Pitcairn in the Pacific Ocean, so The Eighth Commissioner is right up my alley. It’s a really excellent film, and showcases just some of the beauty of Croatia. If the two hours had been filled with just visuals, I would have been equally enthralled. The music before the film. Photo by Karen Salkin. I’m sure that many guests that night would have been more than happy to enlighten me about their country. Before the movie began, a pianist and a duo of vocalists (joined by a group of people who appeared out of nowhere) performed some songs, and just about everyone in the audience sang along! The one that brought the woman next to me to tears is called Majko (which means “mother.”) She explained that it was made famous by the country’s beloved singer, Oliver Dragojevic, who had just died this summer. I totally understood all of the emotion pouring out of the crowd. The film really whetted my appetite to visit Croatia and discover its beauty for myself. Now that I can travel more, I hope there will be a press junket in the not too distant future. Speaking of whetted appetites, right after the Q-and-A with the actors, director, and cinematographer, the “Flavors” portion of the “Night” began. The assemblage was treated to a buffet of authentic Croatian food. 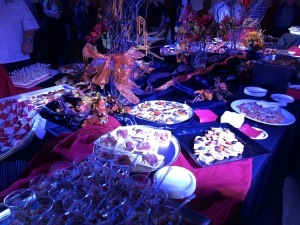 It all looked mouthwatering, but, sadly for me, I couldn’t fight the hungry crowd to get to most of it. I was able to grab a mini sandwich, but when I opened it, I discovered anchovies, so that was a no-go for me. 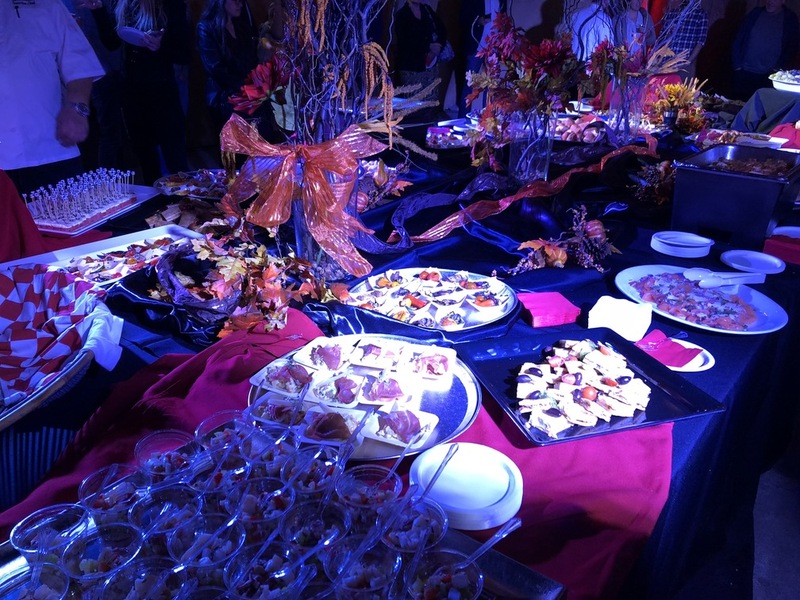 I did get to chat for a minute with the man who appeared to be the founder of this feast, Neno Mladenovic, the chef of one of my all-time favorite restaurants in town, Dan Tana’s. I’ve been dining there since I was a teen, and I always thought their chef was so Italian! I’m thrilled I got to talk to him at this event because he finally cleared-up the mystery for me of why that eatery stopped serving my beloved special dessert parfait. I would have loved to taste his Croatian fare, so hopefully I’ll have that opportunity some other time. He had two famous chefs from his home country working with him on this fete, and I would have liked to meet them, as well. But now I have even more to look forward to if I ever get to that country. 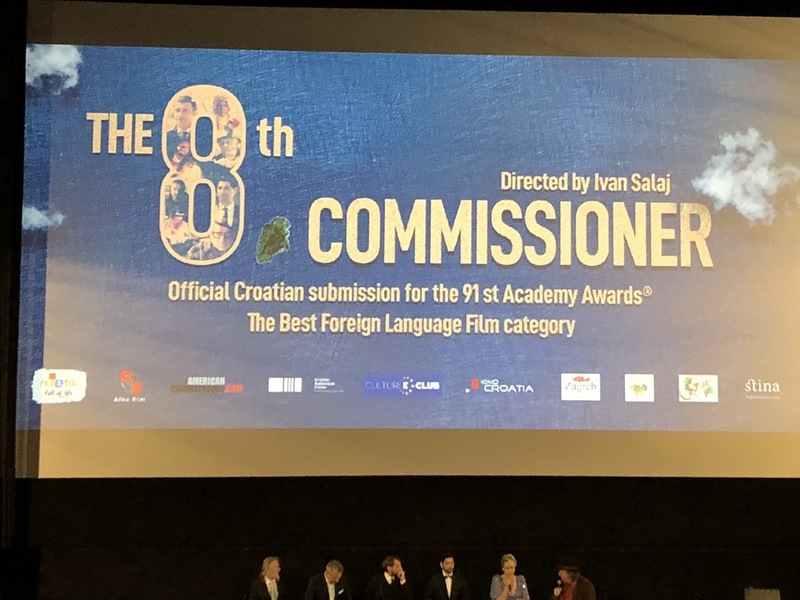 So even though this event did not shed any light on the Croatian flavors for me, I can say without hesitation that you should go see this film. And, hopefully, I’ll have more to tell you about Croatia some other time. Maybe I’ll even be reporting to you directly from that country! Just not from the fictional island featured in The Eighth Commissioner.